Here are a few quick tips to follow when trying to watch your total fat intake as well as the cholesterol-raising fats. Depending on your cholesterol level, most healthy individuals should limit total fat intake to around 25-35% of total energy (total calories eaten) each day. While it is important to watch each individual food’s fat content, remember that this 25-35% fat range is your overall dietary goal; you’ll always encounter foods that are under or over this percentage. Your goal is to keep most foods you eat within this desired fat range. Low fat– means the food contains 3 grams (g) or less fat per serving. If it is a whole meal (e.g. frozen entrée) it is low in fat as long as it contains no more than 3 g of fat for every 100 calories. Low saturated fat – means the food contains less than 1g saturated fat per serving. Low cholesterol – means the food contains 20 mg or less cholesterol per serving and no more than 2 g saturated fat per serving. Reduced fat, Reduced cholesterol - means the food has 25% less fat or cholesterol than the comparable food product. Fat, saturated fat, trans fat and cholesterol free – the food contains inconsequential amounts of the nutrient specified per serving. If you eat more than one serving you increase the amount of these nutrients; be aware that they add up quickly. Light or Lite in fat– means the food must have 50% or less fat than the comparable food. Less than 10 grams total fat, less than 4.5 grams saturated fat, no more than 95 milligrams cholesterol. Less than 5 grams total fat, less than 2 grams saturated fat, less than 95 milligrams cholesterol. The Nutrition Facts panel provides the number of calories from fat to the right of total calories per serving. Divide 30 by 160 = 19% calories from fat. This is a low-fat food. If the label does not provide fat calories you can do the math on your own. Simply multiply the grams of total fat by 9 (there are 9 calories for every gram of fat). This will provide you with calories from fat. Divide this by total calories. Example: A food contains 120 calories and 5 grams of fat. 5 (g of fat) x 9 (9 calories per g of fat) = 45 (total calories from fat). Dividing 45 into 120 gives you 37.5%. This would not be considered a low fat food. Please note: unless you are following a 2,000 calorie diet plan (which is usually higher than most women or sedentary men require) do not look to the percent Daily Values for fat. This is the percentage of fat based on 2,000 calories and won’t be helpful to you if you are only eating 1,400 calories a day. Always remember to limit saturated fat and trans fat. In excess, both fats can raise your bad cholesterol. Most of us should limit our daily saturated fat intake to 12 grams or less. Choose foods that claim to be “low in saturated fat” or that contains 2 grams or less saturated fat per serving. Trans fat is a trickier one: the Nutrition Facts panel of the food label does provide grams of trans fat yet. This means it is up to you to limit foods that contain the words partially hydrogenated or hydrogenated in the ingredients list. Baked goods like donuts, cookies, crackers and pies as well as fried foods are high in trans fats. Make an effort each week to read a new food label. 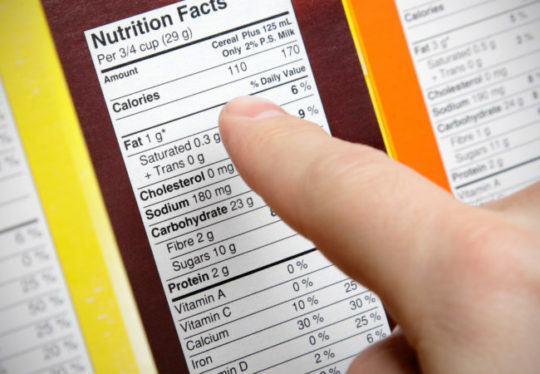 Practice over time will help you feel more comfortable with food label reading. For more information on a heart-healthy diet plan, please contact the Preventive Cardiology and Rehabilitation Program at 216.444.9353 (or toll-free at 800.223.2273, extension 4-9353) and we can schedule a nutrition consultation - or - use our Remote Cardiac Nutrition Counseling Services.